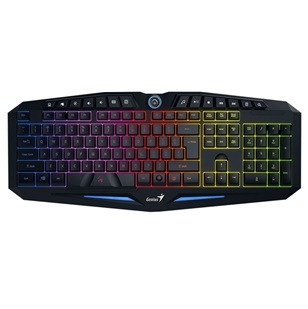 • The 7 color backlighting configuration enables gamers to keep playing and fighting in an unlit room. • The backlighting feature is static and you can adjust the brightness by a dial in the top center of the keyboard. • The Scorpion K9 uses a unique S-shape keycap and laser engraving; it gives gamers a great tactile feel with each keystroke. K9 provide the greatest durability with up to 10 million keystrokes, perfect for high-intensity gamers. • The Scorpion K9 allows up to 19-key anti-ghosting to be registered simultaneously at a keystroke. Gamers can use multi-key input to execute complex commands or actions at exactly the right time. • The Scorpion K9 is a complete ergonomic design for gamers to feel comfortable with the keys and reduces hand fatigue during long playing games.